Commodity OS kernels have broad attack surfaces due to the large code base and the numerous features such as device drivers. For a real-world use case (e.g., an Apache Server), many kernel services are unused and only a small amount of kernel code is used. Within the used code, a certain part is invoked only at runtime while the rest are executed at startup and/or shutdown phases in the kernel’s lifetime run. 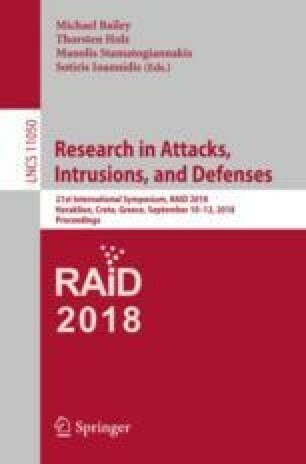 In this paper, we propose a reliable and practical system, named KASR, which transparently reduces attack surfaces of commodity OS kernels at runtime without requiring their source code. The KASR system, residing in a trusted hypervisor, achieves the attack surface reduction through a two-step approach: (1) reliably depriving unused code of executable permissions, and (2) transparently segmenting used code and selectively activating them. We implement a prototype of KASR on Xen-4.8.2 hypervisor and evaluate its security effectiveness on Linux kernel-4.4.0-87-generic. Our evaluation shows that KASR reduces the kernel attack surface by 64% and trims off 40% of CVE vulnerabilities. Besides, KASR successfully detects and blocks all 6 real-world kernel rootkits. We measure its performance overhead with three benchmark tools (i.e., SPECINT, httperf and bonnie++). The experimental results indicate that KASR imposes less than 1% performance overhead (compared to an unmodified Xen hypervisor) on all the benchmarks.